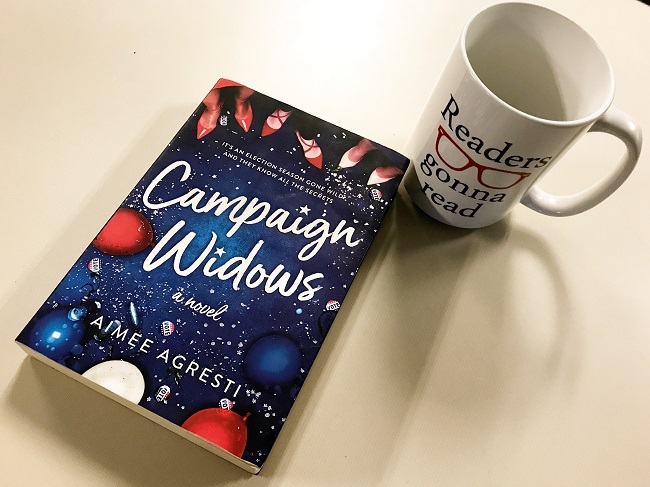 Campaign Widows is a super-fun romp through D.C. politics -- perfect for anyone who’s a wee bit tired of the real politics of DC. As a bit of a news junkie myself, I enjoyed seeing behind the scenes of a presidential race -- and just how seriously some people take every aspect of the campaign season. It’s also fun to see how people capitalize on politics in a town like D.C. We all know there are campaign strategists and chiefs of staff and reporters. But did you know that there are party planners and stylists that solely focus on campaigns? Politics is big business! There’s a chance that some of these jobs are a bit exaggerated in the book. For instance, I don’t think there’s a Birdie Brandywine in the real District known for throwing fabulous soirees on caucus night. However, I would bet there are a few event planning agencies committed to throwing political shindigs throughout the year. And if those parties are at least half as glitzy as Birdie’s are, I’d say they have a win on their hands. Another aspect of the book I really enjoyed was the sense of place it set. The characters lived all over the District, from a brownstone in Georgetown, to a trendy bar in Northwest, all the way to a suite at the infamous Watergate. Even the Smithsonian got a shout out as the setting for Cady & Jackson’s engagement party. For those of us here in the DMV, it’s fun to have connections to those well-known settings. It helps to visualize the story better, and maybe it’s just me, but I feel a bit more a part of the story. As someone who’s dreamt of owning one of those gorgeous Georgetown brownstones, I found myself coveting Reagan’s home throughout the book -- and also her job as a stay-at-home writer with ties to the glitz and glam! While the storyline may have included just a few clichés (my boyfriend is more popular than me!, my fiancé is cheating on me with a blonde!, I’m pregnant and I need to tell my husband! ), I really enjoyed the relationships that grew between the core group of “widows.” So often in politics, you see the interaction between those that are vying for different offices, but you don’t see how that affects their loved ones. It’s an interesting viewpoint the author seems to illustrate from all angles. It’s also fun to think of this group in follow-up books sipping champagne and spending nights on the town, while their spouses are back on the political beat. And I suppose if I can see myself reading future books in the series, I’d say Campaign Widows was a hit! 1. The character of Rocky Haze is a pop star running for office. In the novel, she seems to have some really great ideas to shake up the politics of D.C. What pop star would you like to see run for public office? Ok, I’m not really into Pop music, but I am into Broadway. So, my choice for a future presidential run is Lin Manuel Miranda, because honestly, life would be so much happier (and singable!) with him in charge! 2. Which "widow" are you most like? 3. If you were attending one of Birdie's fabulous soirees, who would you most like to meet? There’s a very long list but I’d say the top five would be: Ruth Bader Ginsburg, (President!) Lin Manuel Miranda, Joe Biden, and Barack and Michelle Obama. 4. In the book, Parker opens a NW-based bar called "Preamble." Is that not the best name for a D.C. bar ever? Also, if it's not the best, what's a better name? I firmly believe that “Preamble” is the best name for a D.C.-based bar, so I honestly have nothing better to add. As always, we’d love to hear from you! If you read the book this month, please leave a comment to let us know! Leave your answers to these questions in the comments! And If you have a favorite DMV author, or a great book that’s set in the area, comment away! We’re always looking to discover new and wonderful writers! Make sure to check back on Tuesday, November 6, for the announcement of November’s Great DMV Bookclub selection! In the meantime, please share the Bookclub with your friends! Did you know that Bill Nye is from Washington, D.C.? He was our last feature in the Our Washingtonians Now column! Check it out here.